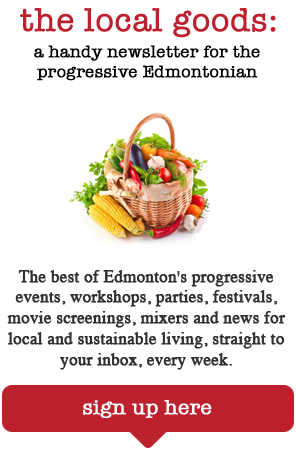 Crystal Carwin Lee (@crystalcarwin) is working her way through the Tomato’s 2013 and 2014 lists of best places to eat or drink in Edmonton. Restaurant profiles will be posted on TLG, and you can find her review of Blue Plate Diner on her own blog. Rima Devitt and John Williams, owners of Blue Plate Diner (@blueplatediner), have been in the restaurant business for 10 years. Their vision has always been to provide fresh, locally sourced, hand-prepared food, a concept that was rather radical when they first opened on 104 Street. Nevertheless, their ability to adhere to the natural coupling of a local diner using local suppliers has gotten easier with the weekly City Market selling produce right outside their door. While the food comes first, one of their passions is in supporting local business, community and arts, and they do so by building relationships with their downtown neighbours — entrepreneurs like them. Rima and John tell me that it isn’t hard to forge those bonds because this area of downtown has always had a great sense of community — a group invested in preserving the architectural landscape of the area and supporting independent business owners. It was that vibe that drew them to the 104 Street block. Now a mix of assorted shops and eateries, it has grown to serve the expanding downtown core and its dwellers. Edmontonians are getting savvier about bolstering establishments that bring a uniqueness to the city. Eclectic in every sense of the word, Blue Plate Diner is distinct. While it seems like they made a concerted effort to get just the right look, they admit that much of that retro quality is owed to the limited funds Rima and John had when they decided to start their restaurant. They trusted their image of what they wanted to builders and designers they already knew, and the quirkiness of the place was brought about by their own personal tastes as well as their limited funds. Vintage cups and lamps were all brought from their house because it created a sense of comfort and home that they wanted others to feel. The menu — focusing on taste, freshness, integrity, colour and quantity — is also inspired by the food that they love to cook and eat at home, including their vegetarian creations, which are a result of their own dietary preferences. In a way, the ingredients become their artist’s palette. Art plays a prominent role in the space, too. No wall stays empty, as they showcase a variety of works. Rima says that when they were first going through the renovations on the restaurant, curious artists that lived nearby or had studios on 104 Street would poke their noses in and see what the owners were up to. It was the beginning of some fruitful relationships between food and art. Regretfully, with the restaurant being as busy as it is, the two of them can no longer oversee the art themselves, so Rachelle Bowen, a server at the establishment and a gifted artist herself, was brought in to curate for them. Rima and John said they truly believe that Blue Plate Diner is there to feed the senses — taste, sight and sound — a culture that comes together in this wonderful package of food, art and music. In essence, Blue Plate Diner looks the way it does and tastes the way it does because it is representative of its creators who constantly endeavor to form lasting connections with their customers that extend beyond the dining experience. Those patrons voted the restaurant into The Tomato’s list of 100 best eats and drinks in 2013, and it is that positive feedback that continues to drive them in their success and reminds them of why they love the restaurant industry.